In response, Marilyn Wann (39-40) and others launched the I Stand Campaign which took aim at the images and messages of the campaign itself. 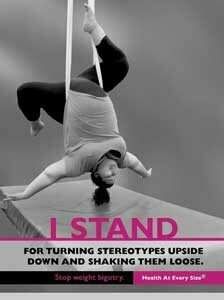 The I Stand Campaign challenged weight bigotry and articulated a clear, realistic and relevant response to simultaneously respect and celebrate strong girls and present a real life images to counter linear and punitive interpretations of weight control messaging. 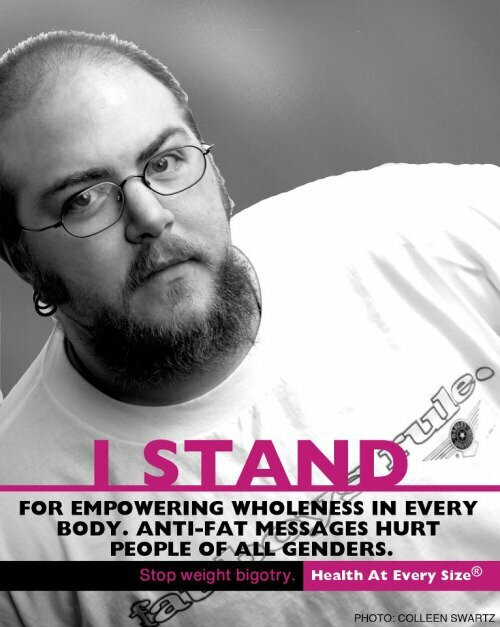 Wann invited individuals to submit photos of themselves with a statement of what they ‘stand for’. 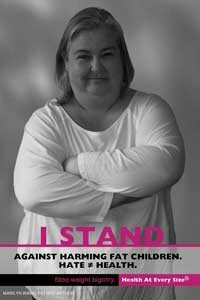 The first poster, featuring Marilyn Wann, read ‘I STAND against harming fat children. Hate /= health’. The counter-advertising stirred controversy, but persisted in making the point that shaming young girls (and others) who were overweight was inhumane and counterproductive. Such organizations as About Face, an organization devoted to equipping girls with media literacy skills helped to articulate the response and why the Strong4Life campaign was ill conceived (41). About-Face is a US-based non-profit organization that equips women and girls with tools to understand and resist harmful media messages that affect their self-esteem and body image.